In 1932, St. Constance Parish on the northwest side of Chicago was the home of a new co-ed school, St. Constance High School. The School Sisters of Notre Dame were in charge of the two-year commercial school that was 34 strong in enrollment on the second floor of the grade school. The school expanded to a four-year curriculum in 1937, with 15 students making up the first graduating class in 1939. 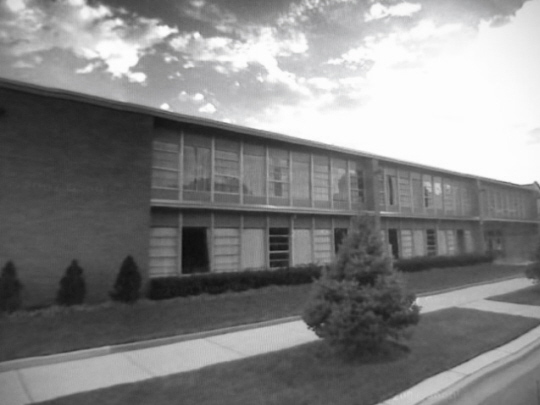 The school was renamed Cardinal Stritch in 1947 in honor of the leader of Chicago's Catholics at that time, Samuel Stritch, and was designated as a a central high school for northwest side parishes. During the 1955-56 school year, the enrollment peaked at 450 students, but decided to become an all-girls' school in the fall of 1960. The student count slowly dwindled away to a total of 291 in 1968-69, when the Archdiocese agreed to close the school. Originally, the plan was to phase out the school one class at a time, but only the junior class members stayed in 1969-70 to finish up and become the last class to graduate. Among the reasons to close the school were finances, a shortage of religious teaching personnel, and the difficulty to operate such a small school. An anonymous contributor to the Glory Days site tells us that the original school building was later torn down to make way for a newer church and school building for St. Constance Parish that is still in use today. There is no record of any post-season trophies won by the school on the IHSA website (www.ihsa.org), although it is possible that the school may never had been a member. Still, students at Stritch could have participated in activities to round out their educational experiences at the school, such as band, choir, drama, GAA, Sodality, and many others. We would like to hear from a graduate or a person who was close to the school about some of the activities that the students had while attending Stritch. "I was one of the graduates in the last graduation class of the school in 1970. In looking at a HS graduation picture, my cap and gown was red and white, which may have been the school colors at that time. There were around 87 students in that last graduating class. I will have to dig out my yearbook to be sure of the number. In my 4 years there, we had a Mission Club, which I was a member of. We had Future Teachers of America, Choir, Drama and Sodality. In 1980, we had our ten year reunion, which I attended. A 25 year reunion was held, which I did not attend. 2010 will be our 40 year reunion, but so far I have not heard anything. I have been searching the internet for that, which is how I found your website." From Mary Lou (Barwig) O'Brien (class of 1954): "Hi, I just found out about this link tonight after having dinner with my daughter and her family. I mentioned that I would like to locate some of my friends from Cardinal Stritch High School. I have so many happy memories from my years of 1950-54. Sister Valencia was the principal and Sister Lucille Marie was also a nun there. I remember her so well because she was one on my mother’s best girlfriends! So I had to behave very well, which wasn’t easy for me! I do still keep in touch with some of my girlfriends but haven’t heard of a reunion since our fabulous 50th one on Oct. 9, 2004.......we were going to do it again 5 years later, but haven’t. I would love to help out getting another for right now.....who has to wait for another special year??? If you have any info on who I can contact or how to get another reunion going for class of ‘54 and also how to locate some people from class of ‘52, I would appreciate it. You have my address and I have the one below that was on the link. I am also on Facebook." I graduated from Cardinal Stritch H S in 1961.The photo on your website is of the “new” St. Constance Grammar School, not Cardinal Stritch. This building stands on the site of the former “grotto” that was there. Our class held their 50th reunion last July (2011). I’ll send a link to your page to the reunion committee members and maybe some of them can provide more photos and information. I think they do know the words to the school song.